"INSIGHT Article - Cultural Challenge Series - #1: Mapping Capabilities to Customer Value - An Innovative use of 'Voice of the Customer' by Michael Poehner and Denny Sigloh"
The following article is one of a multi-part series on cultural challenges, utilizing The INSIGHT Group's 10 Elements under its Solutions / Services Business Model Architecture. The series' full introduction is reprinted below, but you can jump to this article's specific element #1 - Mapping Capabilities to Customer Value: An Innovative Use of 'Voice of the Customer' by clicking here. 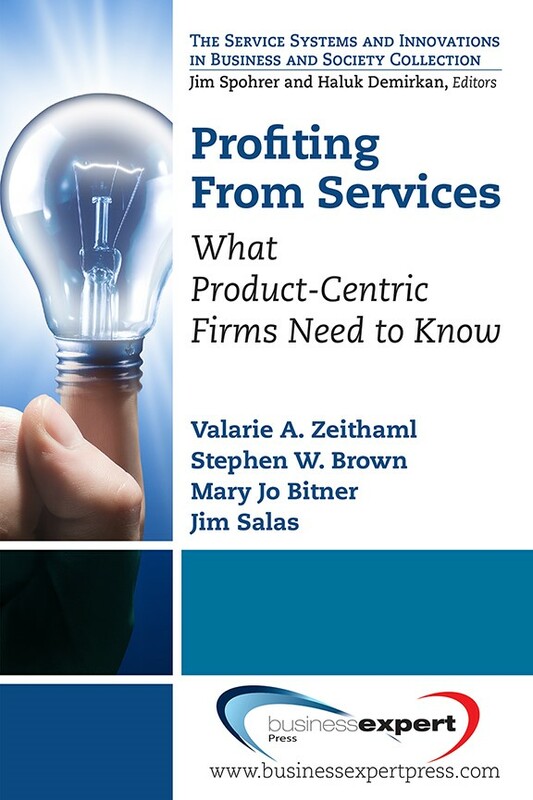 The key to executing these principles is not to sub-optimize either the services or product businesses, but to maximize shared assets, intellectual capital and expertise. Critical to the success of installing / operating a services business model is the ability to establish a customer-centric business culture and supporting services business processes. Culture can be viewed as a system of shared beliefs, values, customs and behaviors, that the members of the company use to relate to their customers and with one another; these are transmitted from generation to generation through learning. Peter Drucker (The Theory of the Business) sees business culture as the legacy behavior patterns that result from the previous successful business strategy / model. The longer the success, the more difficult it is to change; or even to remember why we do these things and behave this way. 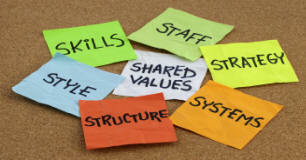 A new business strategy / model requires changing / evolving your culture in order to execute it. In fact culture is the critical success factor in execution. 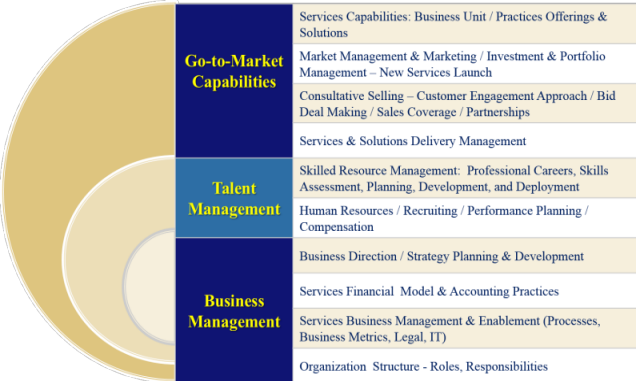 The Services / Solutions Business Model Architecture has ten design elements covering Go-To-Market Capabilities, Talent Management, and Business Management. Our experience has found that the existing culture is many times the largest barrier that the organization / leadership have in making the shift to this new model. This series will examine the ten elements and point out some of the cultural challenges that can get in the way of making the change. For a more detailed description on each of the ten elements of INSIGHT's Solutions & Services Business Model Architecture, see the INSIGHT White Paper, Transforming into a Customer Solutions Business. "Mapping Capabilities to Customer Value"
How do you know if the capabilities that you can offer have any value? Instead of trying out offerings in the market, there is a much better way to do this. The Services Offerings Development Process has 7 steps. This article will focus on step 2, which uses a detailed voice-of-the-customer feedback to determine which of your company’s capabilities have value. 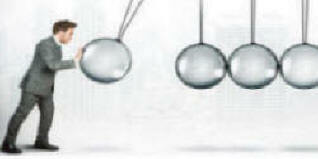 Product companies use market research, focus group sessions, and customer product satisfaction feedback reviews to determine the features of their tool/product; yet this approach is not effective in services, where each customer is singularly concerned with solving his/her problem and each customer is unique. 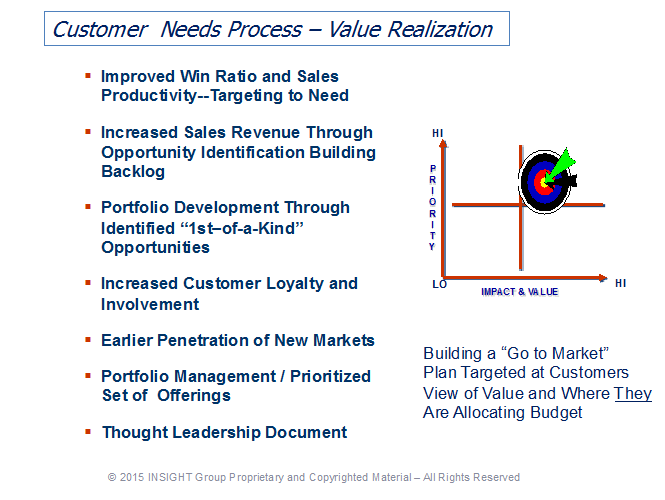 Using the Wants & Needs VOC approach allows you to understand both the market needs as well as individual customer needs--which is invaluable when developing services and solutions offerings that can be mass-customized to address each customer's unique needs. The cultural challenge for product companies is to approach each customer as a 'market of one' when assessing the customer’s view of value so as to determine what offerings to develop and/or take to market. This is not only a best practice but also a critical success factor. Is your organization positioned to adopt this approach? The full white paper, Mapping Capabilities to Customer Value: An Innovative Use of 'Voice of the Customer' can be downloaded below. Next Element: #2: Market Management & Marketing: Awareness Creation. Michael Poehner has extensive experience in business strategy development, market coverage strategies, sales management/marketing, Partnering Programs and acquisition & mergers. He led 5 acquisitions as part of the DMR growth strategy, including DMR Canada, ICL consulting UK,and Trecom in the USA. Michael had a distinguished 35-year career in the Technology and Services Business. He has held President/CEO and Senior Executive positions in a number of major Information Technology and Services Companies. Denny Sigloh is Insight's co-founder and has been instrumental in the development of the company's methodologies, including Customer “Wants & Needs Assessments”, Operational Business Plans, Customer Satisfaction Models & Channel Coverage Strategies. Prior Insight, Denny engaged in sales, marketing, product & general management roles at IBM, where he chaired the task force for North America to develop IBM's marketing strategy for the 90s with a specific focus on the development and implementation of services.